Abalone = marine snail, ear shell, sea ear, and ormer. 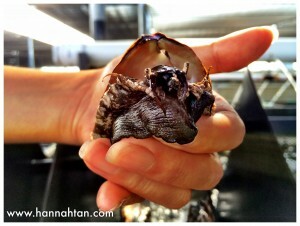 Back to my little adventure at the abalone farm: Big Island Abalone Corporation (BIAC). Just to give you a background of BIAC, they specifically produce/farm Ezo, which is a species of abalone from the cold waters of Northern Japan; and supply it to various chefs and top-end restaurants in Tokyo, Waikiki, Las Vegas, Los Angeles and San Francisco. Apparently it takes only 20 hours to ship live abalone door-to-door from this farm to Japan. Side-track a bit - Did you know that the famous Japanese iron chef Masaharu Morimoto-san was here too?!! …becomes a full-grown marine snail in approximately 3 years. So what exactly happens on this farm? Basically the baby abalones are kept in the nursery for 6 months before being sent to the “growout” area comprising of 336 cages located in 32 tanks. From 3 months of age, they feed on this nutrition-packed marine algae. …and shipped out in these boxes. It’s so strange because I’ve only seen abalone in its “edible” state – either on a plate or in a tin can; hence this educational tour was definitely an eye opener for me. You learnt about the food chain in school right? No salt, no seasoning and cooked to perfection. Aaaaand, because it's quite nutritious, I don't feel so bad either. Haha. Have a wonderful week ahead guys! Mwah!